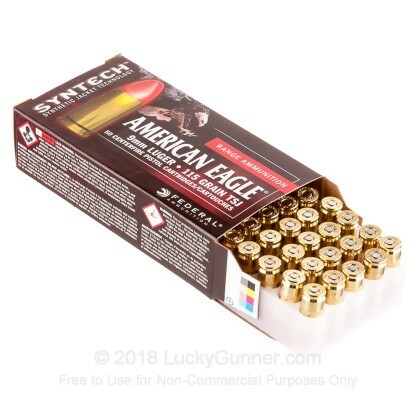 For an ultra-clean shooting experience free of any lead or copper fouling in your barrel, you need to try this 9mm Syntech ammo by Federal American Eagle. 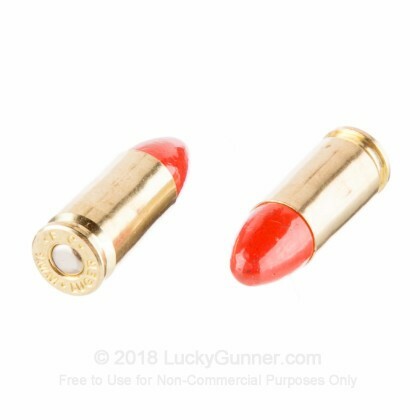 The 115 grain non-magnetic projectile is completely covered in a total synthetic jacket (TSJ) made of a red polymer that prevents metallic friction in the barrel and reduces heat. Federal uses lead-free primers and clean-burning powders that are safe to use in both indoor or outdoor ranges. These premium range cartridges are constructed using Boxer-primed brass casings that are new-production, non-corrosive, and reloadable. 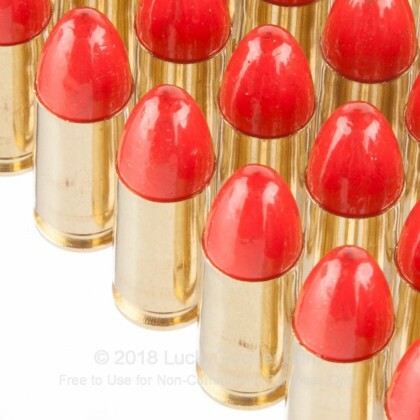 This 500-round bulk case of 9mm ammo is the high-volume shooter's dream. Not only will you have 500 rounds of premium ammo to fire, the TSJ design prevents buildup that can inhibit firearm performance. You can spend more time on the range between cleanings, which translates to more fruitful practice time. So what are you waiting for? 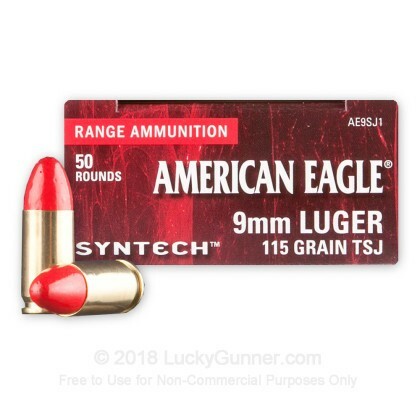 Give this 9mm Luger Syntech ammo by Federal American Eagle a try! I bought a 500-round case of these earlier this year. Through a variety of drills at distances of 7 to 20 yards (including slow fire) through both a Walther PPS M2 and a Glock 26, this was all over the place. Both shooters were feeling really bad about ourselves until we switched to traditional FMJ ammo and were immediately much better. This may be OK in traditional rifling (lands and grooves), but I won't be ordering it again. I've shot maybe 1000 rounds of this stuff, between a bulk order here and boxes from my local store. No issues of any kind. The pitch is that they're cleaner, produce less recoil, and breakup more safely on backstops. I can't really say anything about frangibility because I shoot at an indoor range where I never get close to the backstop. As far as recoil, it's maybe slightly lighter than similar 115 grain 9mm, but not dramatically so. If you really want low recoil, you'll need to use something else--here it's just a nice side benefit. The big win is during cleaning time. There's noticeably less junk in the barrel, and the powder they use seems to leave less gunk inside my pistols. That's valuable to me, and part of why I've been happy with Syntech so far. 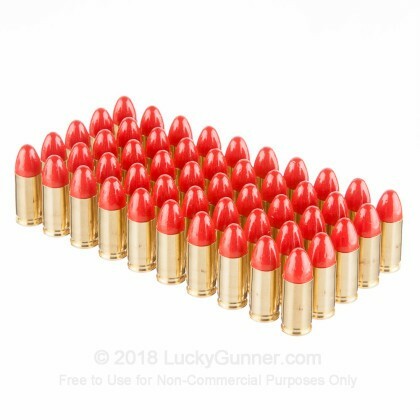 If you generally shoot multiple times before cleaning, or you don't bother with cleaning much at all, then I don't think you'll get much benefit from this ammo relative to other reputable 9mm range ammo. 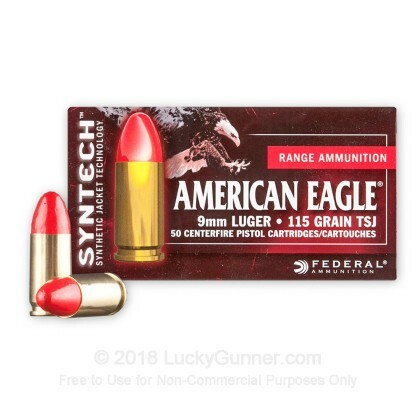 We also have this 9mm - 115 Grain Total Synthetic Jacket (TSJ) - Federal Syntech - 50 Rounds ammo in stock in a smaller quantity.